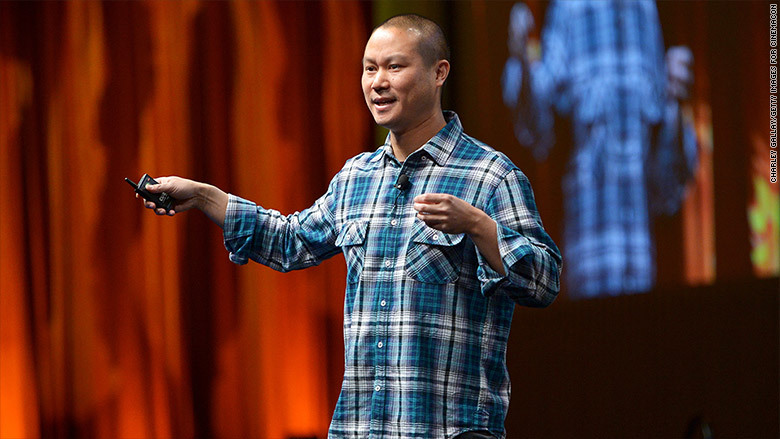 Zappos CEO Tony Hsieh is trying to create a "self-managing" culture at the online shoes and clothing store owned by Amazon. Revolutionizing the way we work is hard. And the payoff could be great ... eventually. But you gotta ask: Is this any way to run a company? No managers. Persistent confusion over what employees will be paid. Sunday night meetings. Perpetual party atmosphere. Public shaming. Welcome to Zappos, six months after CEO Tony Hsieh abruptly declared there would no longer would be any "people" managers and the company would go whole hog in its transition to the management model known as Holocracy and its quest to become a "Teal Organization." A new profile by Rodger D. Hodge in the November issue of The New Republic describes a company still in flux. A new system of "self-organization" has many wondering how to get work done, how to get a raise and how to get ahead -- all while trying to keep up the smiles. Mandatory fun: Zappos has a "tribal," "aggressively festive" atmosphere, writes Hodge, who spent several days at the company in Las Vegas and stayed in the same trailer park where Hsieh lives in an Air Stream. Hsieh described the vibe he was going for this way, according to the article: "South by Southwest meets TED meets Burning Man. But as a lifestyle, not a festival." It appeared to Hodge that "work was fun, which is good, because people never really stopped working. Meetings might be scheduled at 10 p.m. on a Sunday, in the middle of what appeared to be a party, but was really just an extension of the all-encompassing Zappos corporate culture," he noted. Mystery pay practices: Back in June, CNNMoney wrote about how one might go about getting a raise at Zappos under the new structure. The conclusion then: Not quite clear. The conclusion now: Still really not that clear, although a decision has been made to use "badging skill sets" and an internal currency called "People Points." The new compensation policy, Hodge said, "outlined a labyrinthe process that has defeated my most strenuous attempts at comprehension." Those who used to be managers were told their pay would only be guaranteed until the end of 2015. After that their new compensation would depend on the new roles they had taken on and the skill sets they had developed. In other words, there's a chance their pay could go up -- or it could go down. Getting 'beached': Along with pay practices, pretty much every workplace policy has been called into question, Hodge notes, including performance management, discipline and dismissals. Since no one in particular can fire you anymore - remember, no managers - there's now something called the "Beach" or "Why Space" where you go when you don't have a role in the company or when the "lead link" of an organizing "circle" you participate in doesn't think you're good at your job. "Some people who got beached found themselves being shunned as if they were contagious," Hodge wrote. They get two weeks to three months to reinvent themselves. One such shunned employee was asked to read the journal she kept -- now a requirement while beached -- to an all-hands meeting. Apparently the employee's description of how hurt she'd felt when ostracized was so compelling that she was offered a new role at the company while onstage, Hodge reported.